The ‘Settings’ sequence presents a chain of backdrops against which personal events and dramas were played out. Within the dynamic of Seeing Things Heaney deliberately swooped on anything that stimulated memory or association (DOD 320), allowing himself to be transported back by the poems that ‘came on’ to the sites, substances and emotions of primary experience, whence he weighs up what ‘in time was extra, unforeseen and free’(Markings I). Heaney recalls a childhood rodent killer of massive proportions. Witnessed within the Heaney farmstead the deadly power of shop-bought Rat poison awakens myriad associations both contemporary and classical. 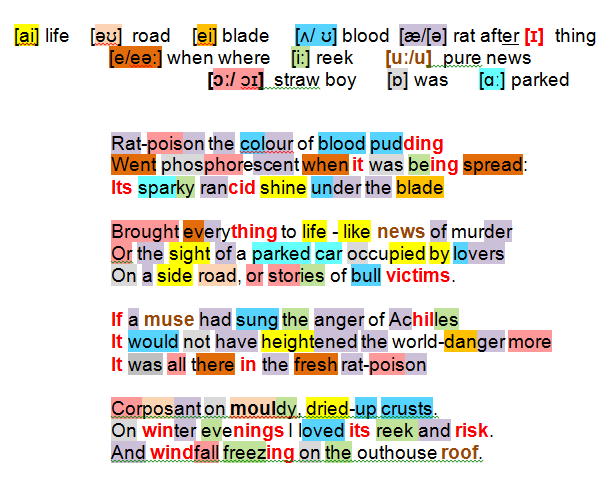 Heaney’s young attention was particularly taken by the mystical change in the substance’s colouring, from dull, reddy-brown blood pudding to light-catching phosphorescent; its thick consistency when applied (spread … blade) was accompanied by a sour pungency (rancid). Above all, Frankenstein-like, it seemed to bear a latent electric-charge (sparky) that sharpened the youngster’s consciousness (Brought everything to life), preparing him somehow for the uncontrolled human behaviour he would meet subsequently: Ulster’s civil strife (news of murder); ‘illicit’ intimate activity (parked car occupied by lovers); blood-sports in Spain (stories of bull victims). Had (if) the legendary anger of Achilles featured by Homer in the Iliad been offered as a comparison it would have borne no greater a threat to those around (heightened the world-danger) than fresh rat-poison with its unearthly electric property (Corposant) spread on mouldy, dried-up crusts and fatally attractive to hungry rats. For the poet now in his fifties the poison’s reek and risk were a necessary peril during his happy childhood and successful, too, if the frozen rat corpses (windfall freezing on the outhouse roof) were to be believed. irony: the substance that triggers memory in the poet kills rats! potential pun: windfall – the context suggests it is not a reference to orchard fruit!